Collecting loyalty points can be easy with LV Lite. Each customer can earn points however you imagine by providing their email address - no user registration needed. You can add loyalty points to their account from multiple websites, social media or even physical stores. Use your secret key to generate code snippets which you or your developers can place in any application that you use. Reward your customer on any action or event: product purchase, social media involvement, newsletter subscription or anything you imagine. Easy implementation: We provide code snippets and support for you. Points from anywhere: Offer your customers to collect points in multiple ways and places. One core: Loyalty points gathered from different sources use the same database and business logic. Internal note (description) I.e. "Product purchase", "Newsletter subscription", etc. When you start using Loyalty Venue, a special web store can be opened with minimal effort. After you have inserted the products and set their prices, just pick a subdomain and your store will be ready. You can even change its look. Your customers can then use their points acquired through LV Lite or via unique codes you give them. You can enable and disable the store at any time. Any change you make to your catalogue (products etc.) is immediately seen in store. Name your store and pick a suitable subdomain for it. Contact us if you need help or have any questions. 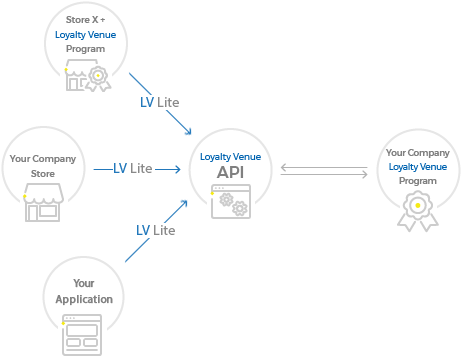 Loyalty Venue is based on a API system that provides scalability and ability to evolve that the platform should have from the beginning to avoid having to recreate everything from scratch in case of future requests for new features and conceptual logic. It is based on a apptoken system for managing campaigns, extension to other countries and the creation of new business entities (partners, new customers, etc.). 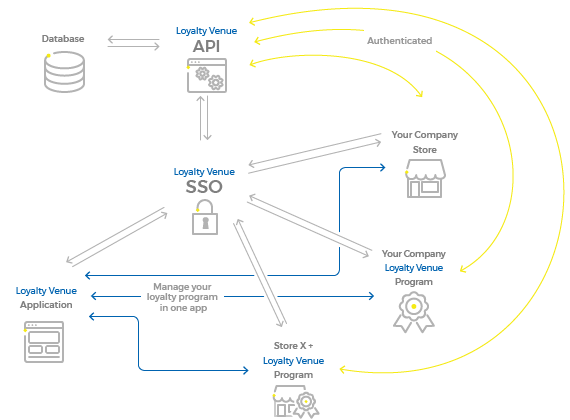 The SSO (single sign-on) Authentication system. The application provides from the beginning a unique authentication system, which allow users to access the various functions of the platform without having to relog. Management of Orders and changes of state; possible changes of status: Created, Confirmed, Processing (Moved to Negative: Standby) Shipped (Moved to Negative: Returned Because Error, Returned Because in Claim / Ticket occurred), Delivered). Brands / Partners. A resource that will allow to manage the entry of new brands to associate with the campaign. The website for consumers may be realized with any custom design: the Client may provide us the design to implement (PSD files), or, on request, the design will be provided by one of our specialized partners. An online shop which will be automatically built from the resources Shop developed in the API system. A shopping cart that will generate the basket for the order. Profile page for the Consumer, where he can consult his points balance, his orders, the history of points and other information that may be enabled in the future. Responsive Design for consulting the website from smartphone and / or tablet. 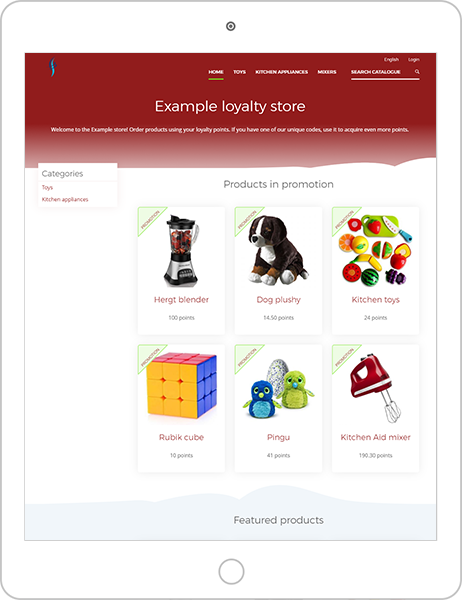 An area of redeem points, where users can enter their unique codes that will find in the products in promotion and turn them into points. 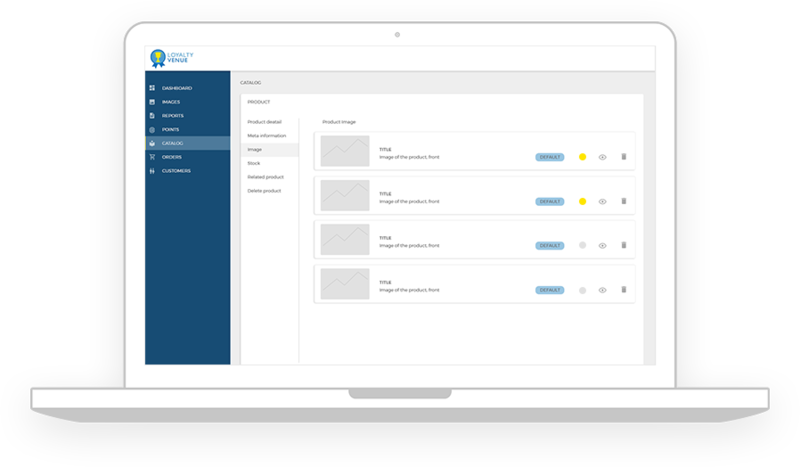 Management system for e-Shop (from here the Client can manage the product catalog. The management can be done directly by the Client, or through our support). Management system for products in promotion: import of existing products with related codes, creation of new products associated with existing codes, creation of new products with new codes. Management of Products in the catalog, with all the related information and the logic of positioning in the catalog. Reporting sistem for generating and downloading reports, including customer data, product codes etc. In conformity with the existing database, you will be able to order new reports in addition to the basic ones, to create and download from the statistics section of the platform. Thanks to this integration, available separately on request, you will be able to view the status of the delivery of the ordered prize, by collecting the information automatically from the information systems of the courier. This service requires an integration that is different for each carrier with which we intend to integrate. Each carrier uses its own different information technology, which in some cases is also obsolete and consists in parts that involve processes managed "manually" by the courier, very susceptible to errors. A full analysis of all existing carriers is currently not possible, therefore, based on our experience we have provided a module that summarizes the average commitment for each integration. This module allows the management of several operators for the Client company, defining individual roles and access privileges. The Client company may also create "user groups" for which will establish the settings and access privilege (what they can do and see inside the restricted area). Ultimately, the Client company can have a role of agency, or first contractor, creating access accounts for their end customer, defining what information will be displayed. Integration of services " for advance and acceleration points "
This module allows the management of transactions by credit card, paypal, or other electronic payment systems enabeling users to order prizes for which points are higher than those earned. From a technical point of view an integration with each electronic payment system and a system of valorization of each prize which allows to define its value in "points" (credits) and the eventual value of " advance points "in money that can be activated has to be made. It must also be developed an accounting system of advance points made by each user, whose history can be consulted through their own reserved area. Thanks to this module is possible to handle tickets that will be opened by users, which may receive a first response and the opening of an mamaging process by the customer care service (which may be internal or entrusted, for example, to an external call center for prize contests that involve large volumes open tickets). Operation log for each phase of the ticket to record the performed activities.